Concerns have been raised over how Irish is taught with many managing just a cúpla focal when they leave school. GAEILGE IS TAUGHT from junior infant level right up until Leaving Certificate level, but according to the 2011 Census, only 1.8 per cent of the population speak Irish every day outside of school. Concerns have been raised over how Irish is taught in schools with many school leavers speaking just a few words following the Leaving Cert. An Garda Síochána were also recently criticised for its lack of promotion and competence in the Irish language, even though they were taught Gaeilge in Templemore. 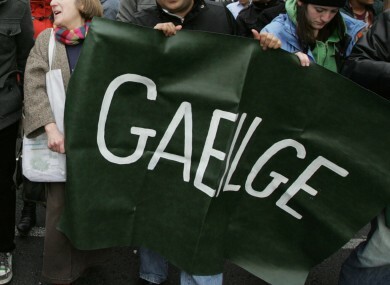 Is it time Irish was made optional in the Leaving Cert, or do you think that would be the end of Gaeilge? Are there better ways of spending taxpayers money on other, more useful subjects? Could poetry, prose and history of the Irish language be taken out of the current course and put into a separate, optional subject? So today we are asking: Should Irish continue to be a compulsory subject taught at second level? Email “Poll: Should Irish be a compulsory subject in secondary schools?”. Feedback on “Poll: Should Irish be a compulsory subject in secondary schools?”.